Pepper Trail is a contributor to Writers on the Range, the opinion service of High Country News. He is a writer and conservation biologist living in Ashland, Oregon. Like everyone else, I hate the smoke that has become southern Oregon’s fifth season, inserting itself between summer and the rains of fall. But as a naturalist, I know that many plants and animals in our region benefit from fire — mountain bluebirds and lodgepole pines, morel mushrooms and camas lilies, beargrass and huckleberries. Native peoples skillfully used fire as a management tool, maintaining oak savannas rich with acorns and deer. For all the damage fire does to the human world as presently organized, it is far from being an ecological catastrophe. Quite the opposite, in fact. 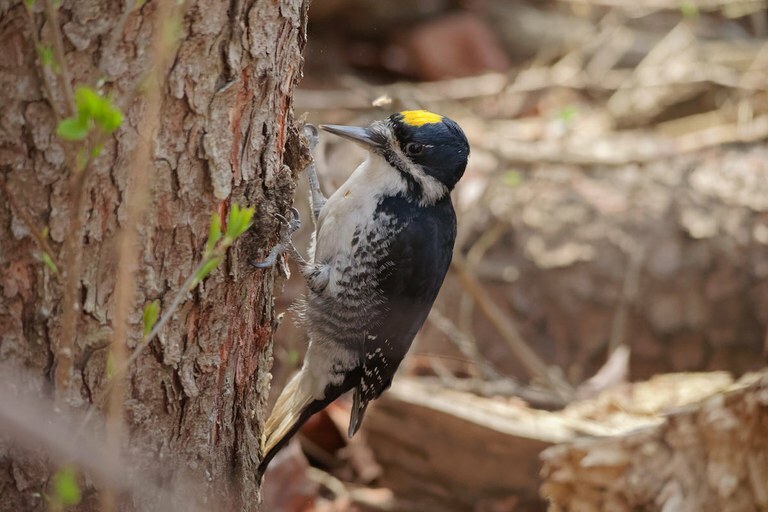 Wildfire is ecologically important for wildlife like black-backed woodpeckers. The smoke came in from the southwest, thick and yellow-gray, drifting over the Cascade crest. The scent filled BB with restless energy. Only a week before, two of her chicks had starved despite the tireless efforts of BB and her mate to find enough beetle larvae to feed them, and the single fledgling, small and weak, had been easy prey for a Cooper’s hawk. Now, with nothing to hold her to this territory — a green expanse of pine forest that harbored little food for a black-backed woodpecker — BB set out to find the fire. The wind had carried the smoke far, and by the time she reached the burn weeks later, the fire had passed. What she found was paradise for a bird like her. Like most fires, this one had left behind an ecological mosaic, a mix of blackened snags, scorched but living trees, and mysteriously untouched patches. And BB was not the first arrival; drawn by the scent of smoke, wood-boring beetles had already taken up residence, laying their eggs in the dead and dying trees. They were already being pursued by the resident hairy woodpeckers and the first pioneering black-backs. The next spring, the snags positively vibrated with the gnawing of beetle larvae — a continuous feast for a whole community of woodpeckers. BB was perfectly at home, her black back making her almost invisible against the charred trunks as she pounded into fire-hardened wood too resistant for the other species. Black-backs had flocked to the burn from a wide swath of the Cascades, and BB had never had so many suitors. She chose well, and in that first year on the burn, she and her mate fledged a full brood of five fine young. In the natural cycle of post-fire recovery, the burn would have remained prime woodpecker habitat for five or six years before beetle populations dwindled and the younger black-backs dispersed to find more recent burns. In this case, the natural cycle had no chance to play out. 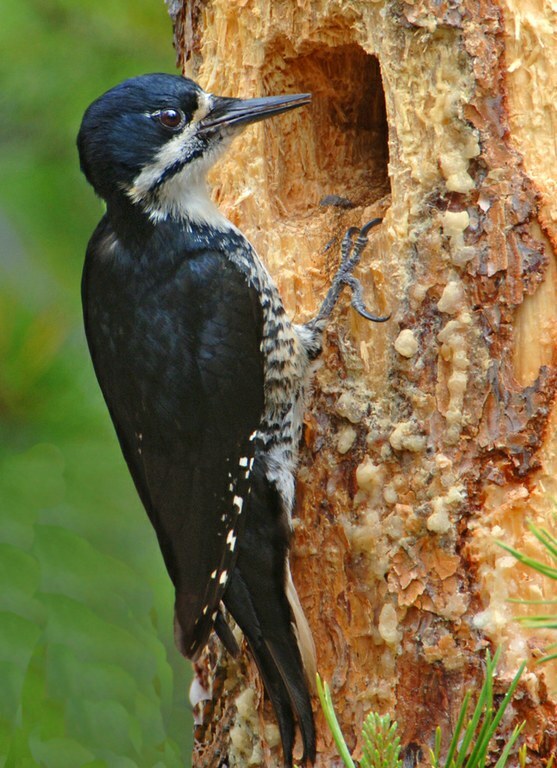 Black-backed woodpeckers eat beetle larvae that feast on burned over forests. As the snow melted in the second spring after the fire, the quiet was shattered by the rumble of logging trucks and the whine of chainsaws. Salvage logging had begun, and the soil was compacted, the recovering herbs and shrubs were crushed, and the nutrients held in the decaying wood were hauled away. And of course a forest of snags that was home to a diverse community of woodpeckers and cavity-nesting birds was destroyed. BB retreated to the far side of the burn and began to excavate a nest hole with her mate, but one day he disappeared, whether driven off by the disturbance or taken by a predator, she never knew. She wandered east, hoping to find a patch of beetle-killed lodgepole pines. Then, one hot August day, she caught a delicious scent carried on the wind: It was the smell of smoke. Heart full of joy, BB once again set off to find the fire. Even with the eyes of an ecologist, it’s not easy to see the beauty in a freshly burned forest. But I know it is there — the wildflowers hidden beneath the ash, the woodpeckers summoned by the decaying snags. For centuries, this landscape has owed much of its variety and vitality to fires. I may never share BB’s enthusiasm for smoke, but as I consider the exquisite adaptations her ancestors made to this environment, I find a new acceptance of this fire-prone place we have all chosen to call home.